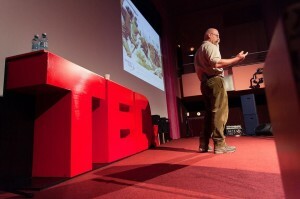 Joep van de Vlasakker from Rewilding Europe was one of the passionate speakers at the TEDxEroilor event in Romanian Cluj-Napoca recently, talking about the fascinating European bison. “Challenging minds” was the theme of this fifth edition of TEDx here, and Joep did precisely that, challenging and amazing the specially invited members of the audience with a number of bison stories. He started with “Once upon a time”, and ended with “Coming soon, to a place near you”. Joep arrived to his presentation coming straight from the Tarcu Mountains, which will be the new home of a herd of European bison from mid-May and onwards. Born in the Netherlands, Joep was raised among falcons, hawks, hunting dogs, horses and other animals. He studied Forestry and Nature management and already as a student showed great interest in wilderness and in giving more freedom to nature. Over the years he worked on more and more with bison and is now involved in several bison reintroduction projects, including the one in the Southern Carpathians. On May 17, around 20 European bison will be brought back to the Tarcu Mountains in the Southern Carpathians. This will be the biggest-ever bison reintroduction and transportation yet to have happened in Europe and Joep van de Vlasakker is one of the main driving forces behind it. In Cluj-Napoca, this wasn’t maybe TEDx’s largest audience, but,when you consider the massive international outreach by TEDx through the web, there will be millions listening over time.. Joep’s stories challenged people to rethink the way we see our economic relationship with nature, because nature conservation and business development can actually go hand in hand. This is an essential idea behind Rewilding Europe’s work in helping local people create benefits from the wildlife and wild areas, which is key for community-based conservation. He spoke about the work Rewilding Europe and WWF-Romania are doing together in two important rewilding areas in Romania: the Danube Delta and the Southern Carpathians. Joep’s bison stories were just one of the 8 different ways in which nature and humankind were challenged by the different speakers at the event. Each of them trying at the same time to answer but also find new questions. Luis Alvarado Martinez picked information and the power of an educated choice as his way of changing ideas. Alin Uhlmann Useriu focused on nature and the concept of community and volunteering. He drew information from his background, as he built a volunteers’ wonderland in Bistrita, called “Tasuleasa Social”, which is now one of the most prolific green NGOs in Romania. Andrei Mihalca told a story about that place where risk shares a border with precaution, and the cultural challenges he faced during his work in equatorial Africa. Sculptor Liviu Mocan chose to reshape common beliefs through marble, wood, granite and clay. This way, through his “Following the Sun” project he managed to create a 7-meter high sculpture on every continent. And because things are never black and white, Silviu Matu spoke about feelings and why negative emotions can be healthy while somethimes positive emotions can stand in our way towards success. Others challenged minds and sparked bright ideas by doing what hadn’t been done before, like Andrei Ruse who at only 22 has already launched three novels: „Soni”, „Dilăr pentru o zi” (Dealer for a day), and his most recent book, „Zaraza”. TEDxEroilor ”Challenging Minds” was presented together with WWF-Romania. TEDx is a nonprofit organisation devoted to ”Ideas Worth Spreading”, started as a four-day conference in California 25 years ago. TEDxEroilor is a local, independently organised TEDx event, operated under license from TED, where speakers try to spark deep discussion and connection in a small group.